WAAS Math Counts Team Takes 5th Place! 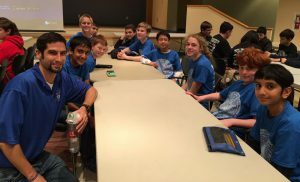 Congratulations to Mr. Simon and our Math Counts team for taking 5th place in the Regional Math Counts Competition. Competition was tough and only 4 points separated the top 5 teams. We are so proud of our Math Counts Team and can’t wait to see where we place in our next competition.